Even as Disney+ ominously floats above the horizon, the likes of Marvel TV is still flirting with probing satellites on third party platforms. New animated series has been announced by Marvel TV, which will make their premiere on the Hulu streaming service. 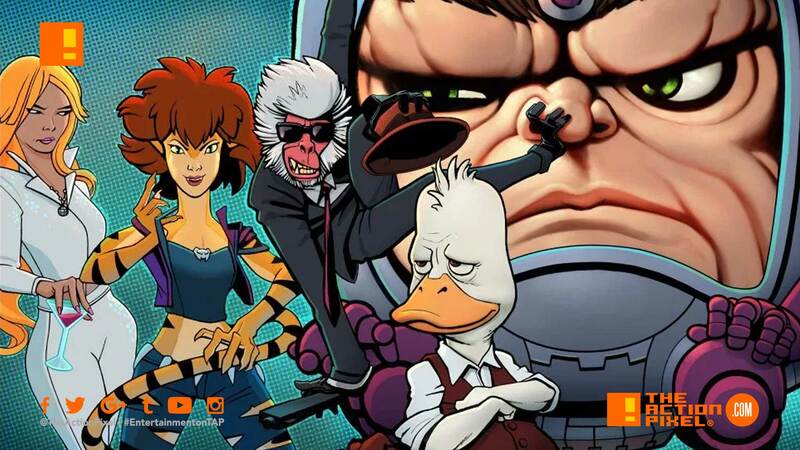 The Marvel TV animated shows include M.O.D.O.K., Hit Monkey, the Tigra & Dazzler Show, and Howard the Duck. The series ultimately are set to lead into a special animated event for Hulu – Marvel’s The Offenders. In Marvel’s M.O.D.O.K., M.O.D.O.K, an egomaniacal super-villain with a really big head and a really little body, struggles to maintain control of his evil organisation and his demanding family. The series comes from writers Jordan Blum and Patton Oswalt, with Blum, Oswalt and Jeph Loeb serving as Executive Producers. Regarding Marvel’s Howard the Duck, trapped in a world he never made, America’s favorite fighting fowl, Howard the Duck, hopes to return home with the help of his unstoppable gal pal Beverly before the evil Dr. Bong can turn him the crispiest dish on the menu. Thes series comes from writers Kevin Smith and Dave Willis, with Smith, Willis, and Jeph Loeb serving as Executive Producers.